Michelle Scott-- the beautiful GFC TravelCircle host and author of this guest post. 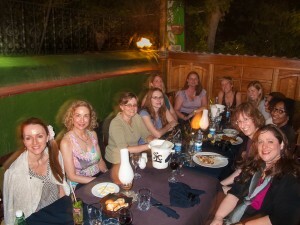 Welcome home to the 15 women who just returned from our 2nd TravelCircle to Cuba! And a huge thanks to Michelle Scott for not only being the GFC ambassador on this trip, but also for writing this guest blog that gives us a glimpse into the amazing experience you all had! Planning an adventure is an interesting thing. You can spend months preparing an itinerary, but you never know when those magical moments will occur, or how, and with whom connections will develop. Such was our experience in Cuba. Our first morning in Cuba, we sat in a circle, looking at 15 unfamiliar faces. Who were these women, who had made group travel to Cuba a priority? One of many amazing meals we shared, talking and laughing, with the yummy Cuban drinks! Each of us had chosen to invest and engage in this particular adventure at this specific time. Most came to learn, some came to be inspired or to find direction, and at least one came to honor the memory of a loved one, who valued travel and culture. All were united in our value of friendship and adventure. GirlFriendCircles (GFC) began TravelCircles this year. While each trip is unique, all focus on two main components. 1) We travel together with the intention of connecting with each other in a meaningful and honoring way. 2) We learn about the lives of women living in that particular country/region. Because GFC teams with Altruvistas, we are able to experience Cuba or any country we travel to in a deeper, more connected and invested manner. In other words, we’re not there as passive tourists. We show up, ready to engage and build relationships with the people we meet. 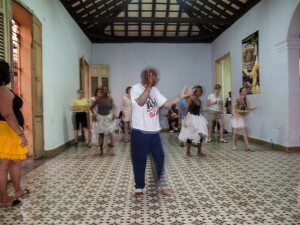 A dance class where we got a chance to watch the best perform and then learn to do some of the steps ourselves! On this particular trip, we learned from Cubans with firsthand knowledge of history, architecture, politics, healthcare, literacy and education, music, art, community development, and social services. At times, our role was more like new students, soaking up information. Other times, we were colleagues, processing what we were learning and integrating it with previous knowledge. Because there was mutual respect and interactive conversations, it was an engaging way of learning. We learned about The Cuban 5 and how Cubans view the U.S. embargo/blockade. We learned about diversity and prejudice. We gained new appreciation for murals and the value of art within a community. We learned how to make our own perfume. We learned to dance, laugh and fan our way through Cutumba. While much of our itinerary was full (because learning hours are required for our visas), there were times, when we practiced slowing down enough to listen, engage and experience. And we loved those moments that unified us with little to no effort on our part other than being present in the moment and accepting its gifts. Are you considering travel with GirlFriendCircles? Now is the time to express your interest. Many trips are planned for 2014. (See the list of all 9 trips below!) These adventures are full of great activities and opportunities to meet wonderful people, who also value friendship. What could be better than experiencing a new culture while building connection and friendship? Ready to explore the Parthenon, Acropolis, and the Temple of Zeus? This is trip with spirituality, myths, beauty, art, and the divine feminine. Combine the best wildlife of a Safari with amazing opportunities to learn about social causes and regional issues affecting women in Africa. Ready to understand a country in a more real way than just what we see on TV? Watch history unfold in an intimate and local way. Get ready to dance, cook, sip wine and inhale all the beauty, culture, and history of two amazing countries: Argentina and Chile!